"CLIBURN; a parish in WEST ward, county of WESTMORLAND, 7 miles (N. W. by W.) from Appleby, containing 205 inhabitants. The living is a discharged "rectory, in the archdeaconry and diocese of Carlisle, rated in the King's books at £9. 1. 5., and in the patronage of the Bishop of Carlisle. The church is dedicated to St. Cuthbert. This parish is bounded on two sides by the Eden and the Lyvennet, and the Lethe rivulet flows through it. A small school has been established for the education of the children of parishioners, endowed with an allotment of land by the commissioners under an act of parliament, which produces an income of £21 per annum; the average number of scholars is twenty. A market was held at Gilshauglin, in this parish, in 1598, when the plague raged at Appleby." M.I.s for Cliburn were transcribed in Monumental Inscriptions of Westmorland by E. Bellasis 1888-89 and are available on Westmorland Papers. AICHBANK, BAILEY, BAXTER, BIRKET, BROWN, BYERS, CARRICK, CLARKE, CLARKSON, COULSTON, CREIGHTON, DALTON, DAY, DIXON, DOBSON, EDMUNDSON, FERGUSON, FURNESS, HALL, HARRISON, HENDERSON, HINDSON, ION, IRVING, JACKSON, LAYCOCK, LITTLE, LONGSTAFF, McDONELL, McHAFFEY, MAGEE, MALLISON, MOOR, NELSON, NICHOLSON, PEARSON, RAILTON, RAYSON, RICHARDSON, ROBINSON, ROBSON, RUDD, SALKALD, SANDERSON, SILL, SIMPSON, SOWERBY, STANLEY, STEPHENSON, STOCKDALE, THOMPSON, WAITING, WATSON, WILLS, WOOFE, WORKMAN, YARKER. and also in 'North Westmorland - An Index to the 1851 Census' compiled by David Lowis and Barbara Slack. You can also perform a more selective search for churches in the Cliburn area or see them printed on a map. Norman nave and chancel. C19th S aisle and windows. Historical and architectural notes on National Heriage List (English Heritage site). History and description on Wikipedia. originals at Kendal RO and microfilm copies at Carlisle RO. See the CASCAT online calogue for WPR24 for information on these and other parish records.. The registers for 1565-1812 have been transcribed by Roland Grigg (available through Wayback Machine Internet Archive): (A to L) : (M to Z) . "Cliburn, Cleburn, Cleyburn, seems to derive the name from its situation. Burn is a rivulet or brook. And there is in the soil here a course of clay, which discovers itself in the channel and banks of the rivulet called Leeth, which runs on the west side of the village, and falls into Lyvennet below Cliburn mill. The parish is bounded on the east, south, and west, by the parish of Morland; and on the north, by the parishes of Lowther, Clifton, and Brougham; and contains about 36 families, all of the established church [in 1777]. The church is dedicated to St. Cuthbert. It is a rectory. 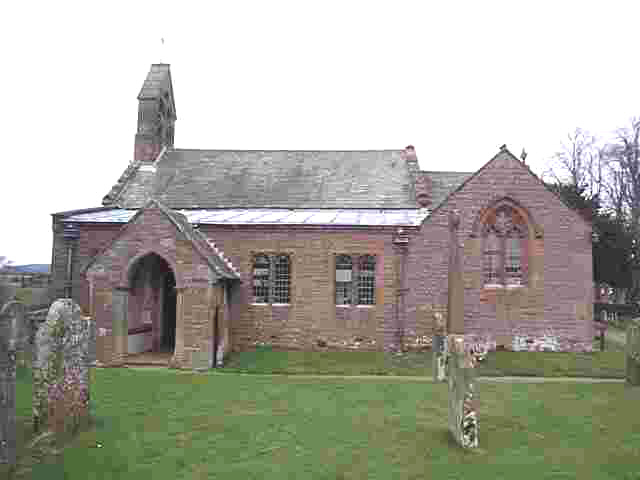 The church, in proportion to the extent of the parish, is very small. The parsonage house is situate near adjoining the churchyard. It is an old building, but in a pleasant situation, by the side of the Leeth. Belonging to this parish is Winderwath, though intercepted from it by the upper part of Whinfell forest, which is in the parish of Brougham; so as Winderwath is no where contiguous to the rest of the parish." Ask for a calculation of the distance from Cliburn to another place. You can see the administrative areas in which Cliburn has been placed at times in the past. Select one to see a link to a map of that particular area. "Clibburn-Talboys, though probably deriving its last Name from Ivo de Talbois, the first Lord of Kendal, whose Possession it was, and whose Posterity assumed the Name of de Lancaster, and from them it passed to the Cliffords through several intermediate Owner's Hands. And Clibburn Herny." Cliburn is in the diocese of Carlisle and wills will be in Carlisle Record Office. Hearth Tax records for 1674 Cliburn transcribed on Edenlinks. Window Tax records for 1777 Cliburn transcribed on Edenlinks.